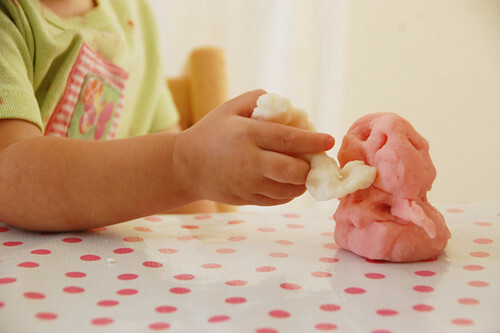 Play dough. I have never really been a fan because I have always thought it smelled funny, at least the store bought ones, so the girls and I have never played it together. Though they have with Auntie Heather who once made it with them in their favorite color pink! Then the other day, I saw this post and thought, "Hey! 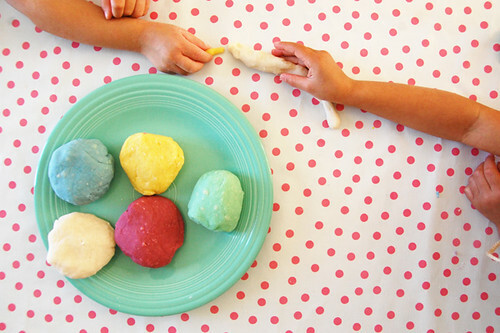 Play dough looks kinda pretty like that." I really liked those colors versus the ones they sell at the store, so I thought we would give it a shot. I told my BFF of our plan to make play dough and she said just to hide the color in the middle and tell the girls to make wishes and that if it changes color, the wish will come true. Oh man. My girls were all about those wishes. Actually, only Brave was. True got tired of kneading the ball pretty quick. Brave on the other hand kept saying, "I wish I may, I wish I might." over and over again! It was as darling as darling could be. Needless to say, lots of different colors were made and we had a blast. Even Soulie was making something (or eating it) as she played with her big sisters. True made snowmen and caves and Brave made ice cream sundaes and snakes. We played and played until they started fighting, then one got sent to time out and play dough time was over. We have them sealed in a ziploc and ready to play again tomorrow. It was the easiest thing to make and I used this recipe. I really like making fun, quick, and pretty things with my girls! I need to compile a list of easy to do kid projects because things like this are so much better than television (though sometimes t.v. is necessary to let me get some cleaning done!). What other quick kid projects do you know of? Have you done the crayon-shavings-melted-in- between-wax-paper-shapes thing? Comes out really pretty! 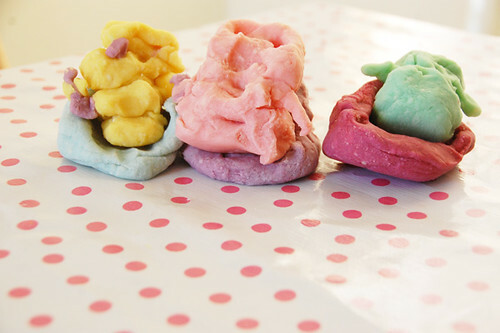 my mom made playdough for us when we were little. we practiced making letters with them and it got to count as part of our school day! :) pretty pictures, i want to try out your hidden color method, so fun! 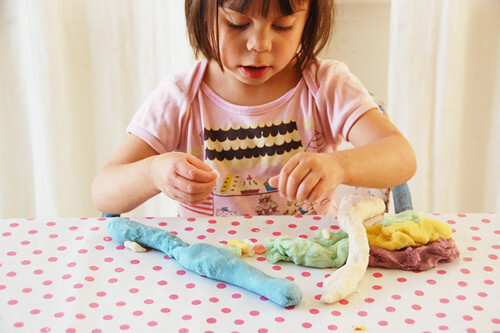 my kids love play dough. Mini-eco has a whole section on boredom busters. you should check it out. muahhaha! True was a giver upper?! THOSE BALLS WERE TOO BIG! 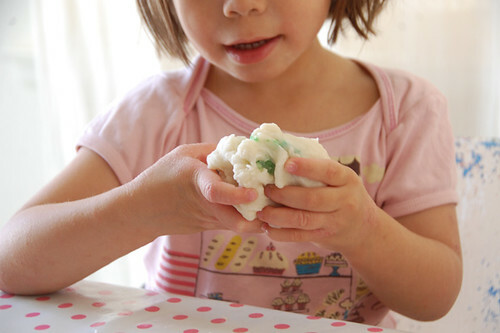 We didd play dough recently too. Such a hit right? 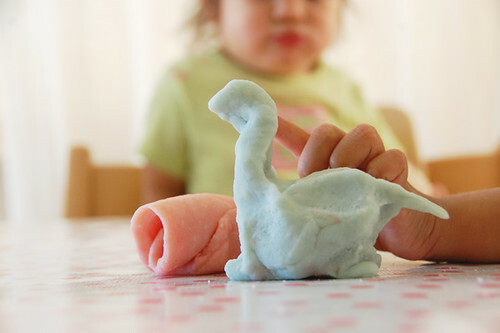 we love to make silly putty too! just mix some borax with a bit of water and add some elmer's glue (you really need to play with the amounts) and you get super cool (and safe) silly putty! we put food coloring in too and my son plays with it for hours. Hi Ruby: We make play doh with this recipe using kool aid powder. It colours the dough and makes it smell yummy too. 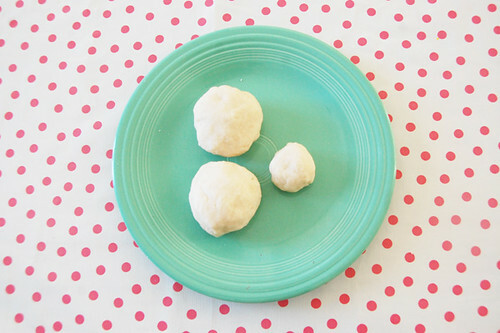 Here's a recipe to make your very own Playdough for your kids. 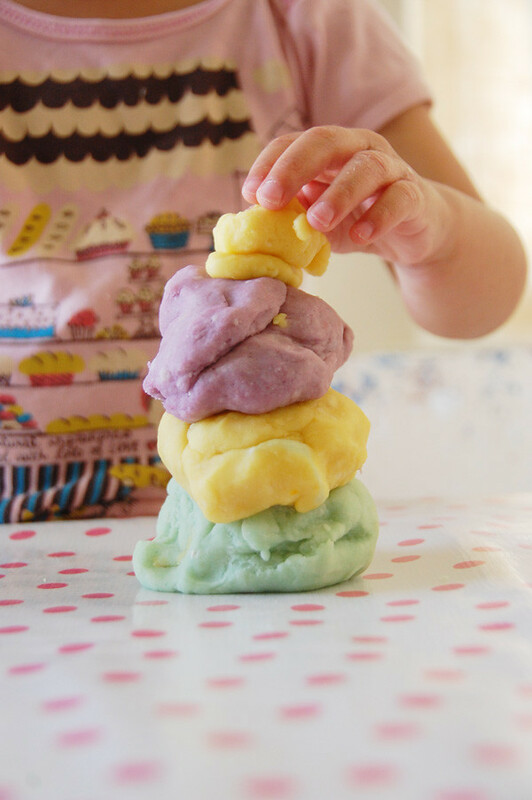 This playdough is non-toxic and is similar to Tutti-Frutti playdough, which is scented, colorful and very elastic! If kept in the fridge, it won't dry out. Enjoy! Ingredients: 2 cups of flour, 1/2 cup of salt, 2 packages (same colour) of unsweetened Kool-Aid (6 gr. each), 2 cups of boiling water, 3 Tablespoons of oil. Recipe: Mix dry ingredients together. Add wet ingredients. Stir with a wooden spoon until mixture becomes less sticky. Take out of bowl and kneed until smooth. Makes 1 large ball. Store in a plastic container in the fridge. So fun! I just stumbled across your blog and love it!! I like to make the following recipe, it's a no-cook one! I hate trying to stir playdough in the pan (it always sticks for me!) so this one's easy peasy!! And I always make orange with pumpkin pie spice for my class in October. yup! koolaid and glitter all the way is how we do it at the 'do! i adore, adore, adore yer bff telling you to put the color i nthe middle. that is brilliant and the pictures are fantastic!